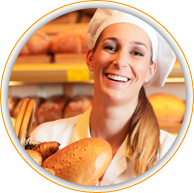 The aim of BAKEserv.com Server is to become a portal for branches of bakers and confectioners. It deals with collecting hyperlinks on sources of information about these branches from all the world. If you have an interesting hyperlink, add it please on our server. After we check whether your hyperlink is correct, we will add it in our data bank. The addition of hyperlink is free of charge. BAKEserv.com Server offers to its clients who are interested in increase of visiting their servers advertising banners. Further information in section advertising. Our dear visitors, we believe that you will find here the information that you need.